Nightclub & Dayclub, located in The Cosmopolitan Las Vegas, a chic, high-end hotel, has created a seamless atmosphere for the professional partier ready to make the most of any 24-hour period. With business hours from 10am to 7pm for the Dayclub and the Nightclub operating from 10pm to 4am, the mistakes of last night quickly transition into the glowing tans of tomorrow, and dancing until dawn becomes dancing into the sunset. Marquee Nightclub & Dayclub has been at the forefront of branding the dayclub and nightclub experience and continues to play an integral part in providing the latest in nightlife entertainment in Las Vegas. The awe-inspiring and modern Marquee venue covers over 62,000 sq ft with an indoor space boasting 50-foot-tall ceilings, a multi-million-dollar sound stage, and massive four-storey LED screens and projection walls. The space also includes an outdoor venue with two pools, a waterfall, two bars, grand cabanas with a personal infinity pool, and for the people willing to spend the big Vegas bucks, Marquee even offers three-storey bungalow lofts, complete with a cabana, living quarters and a party deck on top. What would Vegas be without that kind of over-the-top opulence and luxury? The venue also boasts an incredible roster of resident DJs including Armin van Buuren, Avicii, Chuckie, Benny Benassi, Kaskade, and more. During Electric Daisy Carnival week, Marquee joins forces with Insomniac Events to produce events in conjunction with EDC, combining the infamous Las Vegas strip with the best in electronic dance music. "Marquee is all about the experience and the party," said Daniel Solomon, Marquee Dayclub General Manager. "We've partnered with Insomniac Events to cater especially to the daytime element, we really want to cater to the guests that want to start off their day here at Marquee, and kick off their day on a great note to continue to party at night." 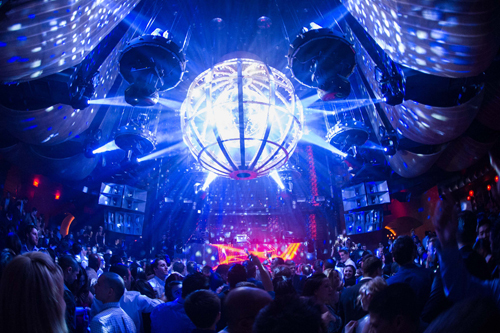 The experience for DJ Mag starts with an escalator ride to the second floor of The Cosmopolitan Las Vegas, to Marquee's entrance located right across from a multilevel sparkling chandelier. Once past the velvet ropes, an elevator ride whisks guests up to Marquee, while the DJ's set is appropriately being broadcast within the elevator to give guests a preview of what's to come. After exiting the elevator and the comforts of the air-conditioned indoors, the blazing Las Vegas heat sets on cravings for a dip in the pool and an ice-cold drink. Armin van Buuren, Jochen Miller and Blake Jarrell kick off the EDC weekend festivities with their hard-hitting trance sets. The world's No.1 DJ's entrance includes a firework display against the cityscape backdrop, with bikini-clad women carrying Dutch flags, inflatable daisies, and banners with Armin van Buuren's name. His set has the crowds going wild and splashing in the pool with every drop of the beat until the sun begins to set over the desert sky. 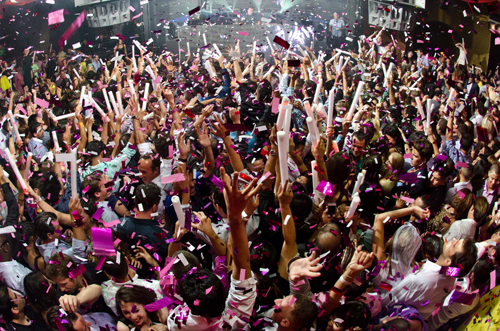 Nightfall introduces Benny Benassi and his own flavour to the Marquee's Nightclub experience. The iconic Benassi not only brings his own brand of electro house, techno, and progressive house to the speakers but also turns up the experience factor with the performers in the club. Robotic creatures with lasers and CO2 guns canvas the crowd, and dancers that can best be described as tentacled aliens perform sky-high routines at the very top of Marquee's massive stage. The next afternoon brings on a newly transformed Las Vegas, now fully immersed in the Electric Daisy Carnival spirit. The scene at Marquee's Dayclub is amplified with a new energy as crowds line up around the entrance, while inside large inflatable penguins, costumed dancers, and half-naked patrons pack the dancefloor and pool for Avicii's electronic anthems. Kaskade, a crowd favourite who is adored by his US fans, has a double shift at Marquee. First, spinning Saturday at the Nightclub, and then back to the Marquee Dayclub the very next afternoon. Kaskade's residency brings his special Summer Lovin' show, which once again redesigns and refreshes Marquee's landscape. The female staff have new Summer Lovin' bikinis and uniforms, special banners adorn Marquee and aerialists perform gravity-defying stunts. The DJ is introduced with an Olympic-style entrance at the Dayclub, which includes American flags and fireworks. Sunnery James & Ryan Marciano are also on hand to kick off the Summer Lovin' show. Insomniac Events Las Vegas Loves Techno series of events takes over Marquee on Monday. These events are intended to breakthrough sub-genres of dance music in what many would consider a mostly mainstream environment in Las Vegas. The EDC recovery party at the Dayclub includes Mark Knight's signature deep house stylings, followed by Umek's techno sound to close out the jam-packed extended EDC weekend under the scorching Vegas sun. Only one stop remains on this party journey. While EDC might be over, the Strip is still alive for the last and final night of EDC Week in Las Vegas. Birthday boy and DJ, Chuckie, helms the decks for a Dirty Dutch-themed party, birthday cake included. As champagne bottles are uncorked, sparklers are lit, and speakers boom as dawn approaches. While the 2013 installment of EDC week has come to a close, the right to party all day and all night will stay intact at Marquee Nightclub & Dayclub all summer long, and Marquee Nightclub holds strong all year long. And since Insomniac's partnership continues as Wet Wonderland on Sundays, the experience will be awaiting your arrival the moment the EDC nostalgia kicks in.